"If you do something to my body that I do not want," says physician/author Angelo Volandes, "it is assault and battery. But if I do the same thing to you in (a medical situation,) it is standard of care." Volandes thinks this last is a bad idea. He is on a campaign to change the way American doctors and patients, and indeed the country at large, understand what is done to American bodies at life's end. 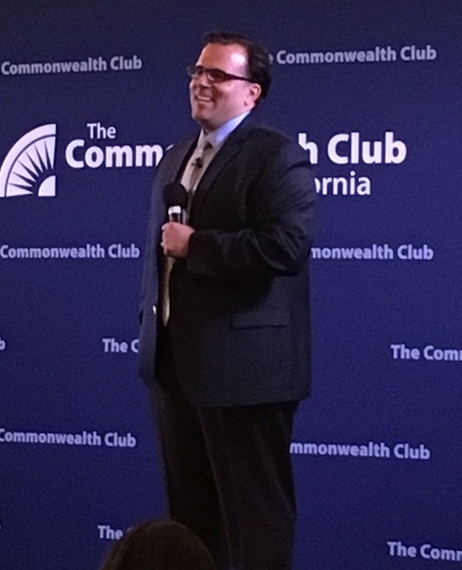 He spoke of this campaign, and his new book The Conversation that outlines it, at a recent Commonwealth Club event in San Francisco. When he's not taking time out to promote the book and the campaign, Volandes practices internal medicine at Massachusetts General Hospital in Boston and is on the faculty at Harvard Medical School. He is Co-Founder and President of Advance Care Planning Decisions, a non-profit foundation dedicated to improving patients' quality of care. "Ninety percent of people want to die at home," Volandes says; "most die in hospitals. There is a misalignment between the type of medical care they want and what they get." About this unwanted care? "If you're in the hospital and get unwanted care you never bargained for, I still get paid for it." After watching too many patients endure end-of-life treatments he was sure they would not have chosen, Volandes started an unusual practice: taking every one of his patients to visit the intensive care unit, and some to visit the dialysis unit. Once they gained a better understanding of what some of the aggressive treatments - CPR, breathing machines, etc - actually looked like, the patients almost always moved away from "Do everything" to comfort care as their choice. The basic change Volandes believes is needed begins with a conversation between physician and patient. Those conversations do happen, and there is now Medicare reimbursement, but few physicians find them easy, and few patients know how to inaugurate them or what to say. "Never did a senior physician have to certify that I could talk to a patient," Volandes says. "The patient needs to know 'What are the questions I need to ask? What are my options?' Life's final chapter needs to be written - but the problem is, I'm writing it (instead of the patient.)" This writer has been advocating for individuals to write their own final chapters for over two decades. With others writing those chapters instead, the costs are monumental and unnecessary - and millions of Americans die after undergoing painful indignities they would never have chosen. Physician aid-in-dying - approved by a majority of doctors and 7 in 10 Americans and now legal in five states - is one key piece of the puzzle. But the elephant-size puzzle piece is how to get every one of us to make known, well before those "end-of-life" days arrive, what medical care we do or do not want. Volandes' conversations could put that piece in place. Every person alive who takes time for the conversation (and for writing it all down) will likely die a better death.